If It Needs Painting We’ll Paint It! Scott Graham established Paradise Painting Contractors in 1992 and since then has become a well known Painter in South East Queensland. Paradise Painting Contractors service the north side of Brisbane and anywhere between the Gold Coast and Sunshine Coast. We also work in the local area at North Lakes, Deception Bay, Redcliffe and Caboolture. Scott has a passion for painting new and existing homes and any other projects you have in mind. He has also painted some of the Endeavour Foundation’s Prize Winning Homes. Scott loves nothing more than standing back after a job well done and seeing the transformation effect. 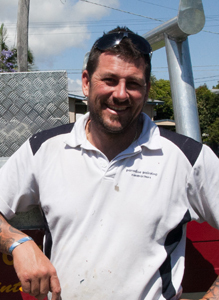 Please contact Scott on 0418 721 887 to discuss your next painting project.